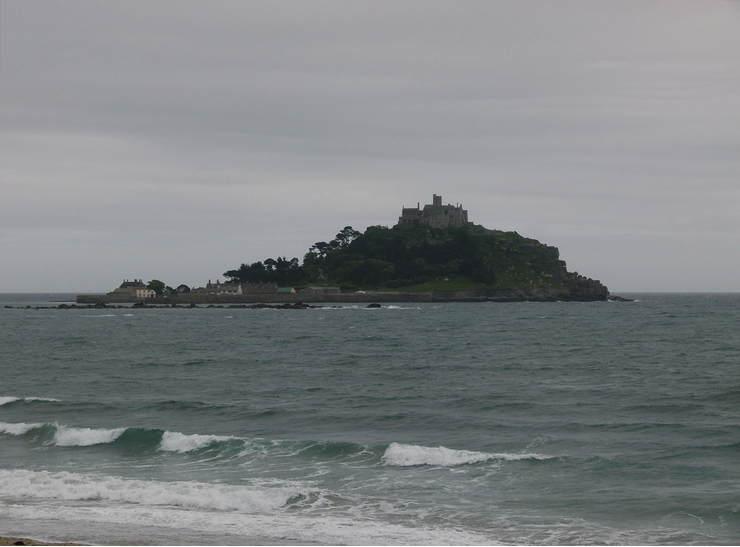 St Michael's Mount Civil Parish. 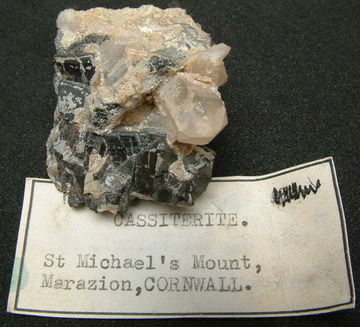 A vein of cassiterite runs out to sea from the seaward side of the mount. Note: This is now a vigorously protected SSSI so no collecting. Reference: Phillips, W. (1823): An Elementary Introduction to the Knowledge of Mineralogy, 3rd ed. William Phillips (London), 535 pp. ; Hogg, T. (1825): A Manual of Mineralogy. Polyblank Publishers (London), p. 128; Hall, T.M. (1868): The Mineralogist's Directory. Edward Stanford (London), 168 pp. ; Collins, J.H. (1892): A Handbook to the Mineralogy of Cornwall and Devon, 2nd ed., D. Bradford Barton Ltd. (Truro, UK), 108 pp. Reference: Hall, T.M. (1868): The Mineralogist's Directory. Edward Stanford (London), 168 pp. ; Collins, J.H. (1892): A Handbook to the Mineralogy of Cornwall and Devon, 2nd ed., D. Bradford Barton Ltd. (Truro, UK), 108 pp. ; Rudler, F.W. (1905): A Handbook to a Collection of the Minerals of the British Islands, Mostly Selected from the Ludlam Collection. HMSO Publications (London), 241 pp. Reference: Phillips, W. (1823): An Elementary Introduction to the Knowledge of Mineralogy, 3rd ed. William Phillips (London), 535 pp. ; Hogg, T. (1825): A Manual of Mineralogy. Polyblank Publishers (London), p. 131; Hall, T.M. (1868): The Mineralogist's Directory. Edward Stanford (London), 168 pp. ; Collins, J.H. (1892): "A Handbook to the Mineralogy of Cornwall and Devon", 2nd ed., D. Bradford Barton Ltd. (Truro, UK), 108 pp. Reference: Halliday, A. N. (1980). 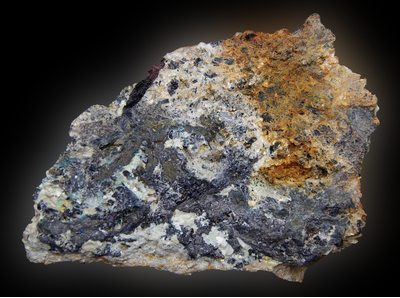 The timing of early and main stage ore mineralization in Southwest Cornwall. Economic Geology, 75(5), 752-759. Description: According to Moore and Howie (1984), kesterite is the most abundant tin-bearing sulfide at this locality. 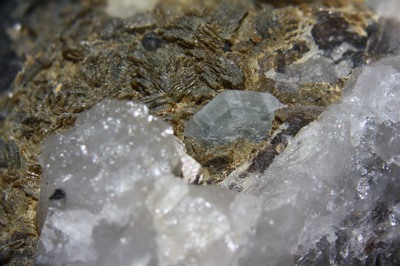 Most of the "stannite" previously reported is in fact misidentified kesterite, while true stannite is very rare and was detected in only two of more than 100 samples studied. Reference: Moore, F., and Howie, R.A. (1984): Mineralogical Magazine 48, 389-396. Reference: Phillips, W. (1823): An Elementary Introduction to the Knowledge of Mineralogy, 3rd ed. William Phillips (London), 535 pp. ; Hogg, T. (1825): A Manual of Mineralogy. Polyblank Publishers (London), p. 161; Hall, T.M. (1868): The Mineralogist's Directory. Edward Stanford (London), 168 pp. ; Collins, J.H. (1892): A Handbook to the Mineralogy of Cornwall and Devon, 2nd ed., D. Bradford Barton Ltd. (Truro, UK), 108 pp. Reference: Collins, J. H. (1876). A Handbook to the Mineralogy of Cornwall and Devon. W. Collins, Sons, & Company. Reference: Forbes, M.D. (1822): Transactions of the Royal Geological Society of Cornwall 2, 366-375. Description: According to Moore and Howie (1984), stannite is a rare mineral at this locality, which was detected in only two of more than 100 samples studied. In both cases, it formed a narrow rim between kesterite and quartz. 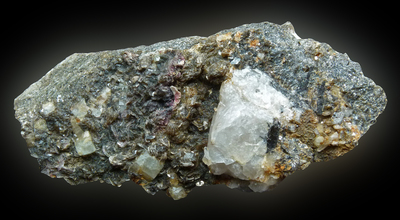 Most of the "stannite" previously reported is in fact misidentified kesterite, while the "yellow stannite" reported by some authors proved to be stannoidite. Reference: Phillips, W. (1823): An Elementary Introduction to the Knowledge of Mineralogy, 3rd ed. William Phillips (London), 535 pp. ; Hall, T.M. (1868): The Mineralogist's Directory. Edward Stanford (London), 168 pp. ; Collins, J.H. (1892): A Handbook to the Mineralogy of Cornwall and Devon, 2nd ed., D. Bradford Barton Ltd. (Truro, UK), 108 pp. ; Moore, F., and Howie, R.A. (1984): Mineralogical Magazine 48, 389-396. 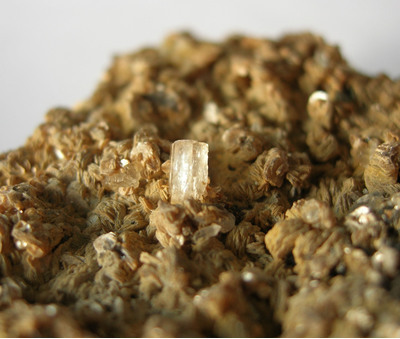 Description: According to Moore and Howie (1984), stannoidite occurs abundantly at this locality. 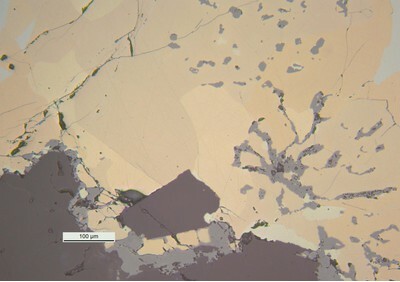 Their results suggest that most of the "yellow stannite" previously reported is in fact stannoidite. Reference: Moore, F., and Howie, R.A. (1984): Mineralogical Magazine 48, 389-396; Golley, P., and Williams, R. (1995): Cornish Mineral Reference Manual. Endsleigh Publications (Truro), 104 pp. Reference: Phillips, W. (1823): An Elementary Introduction to the Knowledge of Mineralogy, 3rd ed. William Phillips (London), 535 pp. ; Hogg, T. (1825): A Manual of Mineralogy. Polyblank Publishers (London), p. 156; Hall, T.M. (1868): The Mineralogist's Directory. Edward Stanford (London), 168 pp. ; Collins, J.H. (1892): A Handbook to the Mineralogy of Cornwall and Devon, 2nd ed., D. Bradford Barton Ltd. (Truro, UK), 108 pp. Forbes, M.D. 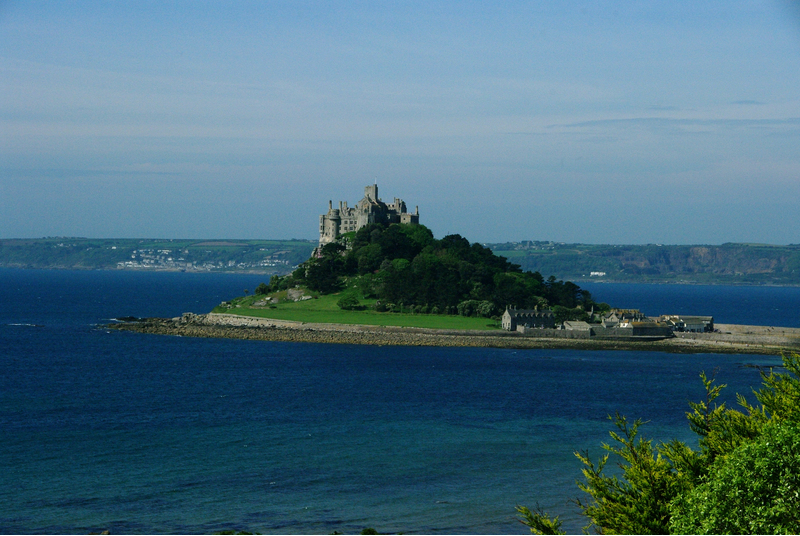 (1822) On the Geology of St. Michael's Mount. Transactions of the Royal Geological Society of Cornwall, 2, 366-375. Moore, F. and Howie, R.A. (1984) Tin-Bearing Sulphides from St Michael's Mount and Cligga Head, Cornwall. Mineralogical Magazine, 48, 389-396.